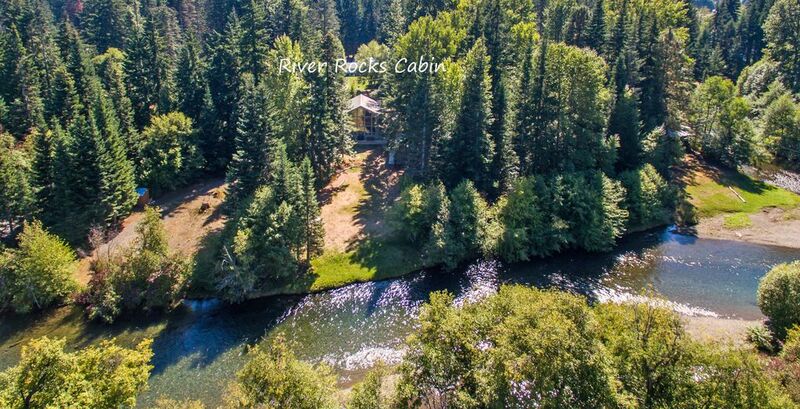 River Rocks Cabin on the Yakima River! Fantastic, private River Front Retreat just minutes to Cle Elum or Easton! * Fantastic Location for Families – the Kids will have a blast without their video games! This 1700 sq. ft. 3 Bedroom, 2 Bath vacation cabin is nestled on a private stretch of the Yakima River between Easton and Cle Elum. Spend your vacation relaxing river side in this spacious chalet style cabin appointed with all the comforts of home, including a private Hot Tub riverside. One of a kind low bank river frontage with a private hot tub, an expansive lawn area, and a path leading down to the Yakima River, Washington’s only designated “Blue Ribbon” Trout River. The central point of the cabin is the very comfortable Great Room that features soaring 30 ft. ceilings and luxurious reclining leather furniture. Relax by the fire and take in your favorite game or TV show on the 55” Flatscreen equipped with Dish Network and a Blu-Ray DVD Player. The Chefs of the family will love preparing meals in the open and spacious fully stocked Kitchen with Stainless Appliances. There’s plenty of prep space and the wall of windows gives you great views of the lawn and river while you’re cooking that special family meal. The dining table offers seating for 6. The cabin is also equipped with a folding table which provides additional seating for 4. The kitchen is supported by a Gas Grill out on the river side patio. The cabin boasts 3 well-appointed bedrooms. There are two bedrooms on the main floor with one King and one Queen Bed. The second floor has another King Bedroom and an open loft with 2 Double Beds. In the loft you’ll also find a relaxing sitting area with great views of the River and Mountains. This is a great spot to relax with your favorite book. River Rocks Cabin has two full bathrooms, one on each floor, each with a shower. Just outside the Great Room is an expansive entertainment deck, and a private Hot Tub with river views!. Just a couple steps off the deck is a large grassy area, which is ideal for summer time lawn games! The kids and adults will both enjoy the riverside Fire Pit and the Horse Shoe Pit. The cabin boasts rare unobstructed low bank river frontage. Pull up a lawn chair and take in the views and sounds of the Yakima River! Watch for fish, ducks, elk, or deer! Take a short 150 yard walk from the Cabin to Lavender Lake, which offers excellent Trout Fishing! (The Lake is stocked several times a year.) Bring your non-motorized boat and enjoy paddling and fishing the entire lake. This is an ideal location for those that enjoy nature, fishing, river rafting, or are in need of some R&R and quality family time. Come stay at River Rocks Cabin and you’ll want to return year after year! 2 Bathrooms, each with a Shower. Pristine low-bank river frontage on the Yakima River. Large lawn area leading directly to the River's Edge. Excellent Fly-Fishing! Beautiful River Side Retreat! Rare low-bank river frontage with a large grass area for yard games. Play horseshoes riverside! Just 150 yards from Lavender Lake for excellent fishing. Float or Fish the Yakima River from your own backyard! Nice get away for me and my husband - we enjoyed the quiet time. The cabin is nicely outfitted for vacationing guests, there wasn't anything we needed that they didn't have. Wonderful cute and accommodating home right on the river! We enjoyed the cozy fireplace, and large, well stocked kitchen. Would stay here again! Cabin was clean and comfy. view was great! we had a very relaxing stay, playing games with the family. We were hoping for more snow to go snowmobiling,but we came late in season. Although cabin is in neighborhood,it is very secluded. We'd love to come back to River Rock in the summer to enjoy the river. Hi John, Thank you for letting us know what you liked about River Rocks Cabin, we appreciate it. River Rocks cabin is a great home and we are so glad to hear that you all enjoyed your stay. Thank you for the nice review too and please let us know if we may be of any future assistance for you. Thank you, Alicia~ All Seasons Vacation Rentals! This is our second time staying at an ASVR property- and we love it!! The cabin has excellent sleeping options, great common area and a fantastic view. Would definitely choose to stay here again. Great stay in a secluded hideaway. My partner and I enjoyed our stay along the Yakima River in this spacious cabin. This venue would have been even more fun with other friends as there was plenty of room to entertain and spread out. We liked sitting in the hot tub and watching the stars come out in the snow the most on our last night there. The small neighborhood the cabin resides within is quiet and the little lake nearby was good to walk around. If you were looking to stay here bring your own provisions or shop at the Safeway in Cle Elum, as there isn't much nearby. They have board games and puzzles to keep you occupied indoors if the weather is frightful. Overall, plan to enjoy the cabin as it's well kept and offers ample room. The views from the large posterior looking windows display a lovely mountain vista with the Yakima River slowly flowing past. And the hot tub is great when the weather is cold or at night. The backyard would be great to play in, but we were visiting in winter so we chose to pursue indoor activities. Thank you for so eloquently describing your stay at River Rocks Cabin, we really appreciate it! We are so happy that you enjoyed this cozy cabin and it's beautiful setting. It truly is a magical place any time of the year! While the instructions for what thermostat setting is allowed during the winter months could’ve been more clear, that truly is the only challenge we had all weekend. The house is beautiful, the view is spectacular, and the property made the weekend for our toddlers and pups. We definitely would recommend this place to others. Thank you for taking the time to let us and our readers know what you liked about River Rocks Cabin, we appreciate it. Please let us know if we may be of any future assistance for you! Picturesque setting on the Yakima River between Easton and Cle Elum! Private and relaxing...you won't want to leave. Large grass area river-side with a fire pit and horse shoes. Only a 150 yard walk to Lavender Lake from the cabin. Don't forget your fishing pole!